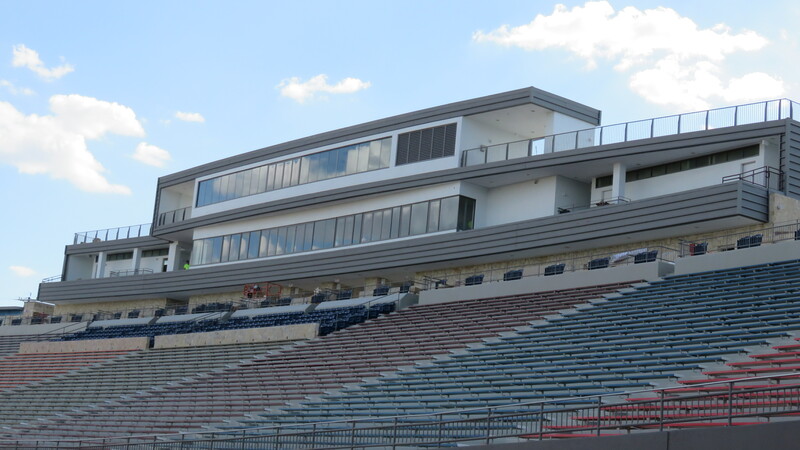 A view of the new Alamo Stadium press box from field level. INFORMATION: This is a 2018 master schedule for all of our area teams and their district rivals. Opponents, dates, times, locations on this unofficial schedule are subject to change. District games for out-of-area district rivals of our area teams, including those involving two out-of-area teams, are listed. New Braunfels (2–3, 1–1) vs. Judson (4-0, 2-0) at Rutledge Stadium, 7:30 p.m.
Brackenridge (3–3, 2–2) vs. Sam Houston (2–3, 2–1) at Alamo Stadium, 7 p.m.
Medina Valley (4–1, 2-0) vs. Kennedy (0-5, 0-2) at Edgewood Veterans Stadium, 7 p.m.
Clemens (4–1, 2-0) at New Braunfels Canyon (2–3, 0-2), 7:30 p.m.
San Marcos (1–4, 0-2) vs. Steele (2–3, 0-2) at Lehnhoff Stadiium, 7:30 p.m.
Smithson Valley (1–3, 1–1) at East Central (4–1, 2-0), 7:30 p.m.
LEE (0-5, 0-2) vs. Churchill (1–4, 0-2) at Comalander Stadium, 7:30 p.m.
Reagan (4–1, 2-0) vs. Madison (3–2, 2-0) at Heroes Stadium, 7:30 p.m.
Roosevelt (1–4, 1–1) at South San (2–3, 1–1), 7:30 p.m.
Edison (1–5, 0-4) vs. Lanier (1–4, 0-3) at SAISD Sports Complex, 7:30 p.m.
Highlands (1–4, 1–2) vs. Wagner (5–1, 4-0) at Rutledge Stadium, 7:30 p.m.
Veterans Memorial (4–2, 4-0) vs. Jefferson (1–4, 0-3) at Alamo Stadium, 7:30 p.m.
Harlandale (3–2, 0-1) vs. Eagle Pass Winn (4–2, 1–1) at Cozel-Foster Memorial Stadium, Eagle Pass, 7:30 p.m.
Laredo Martin (4–2, 2-0) at Southwest (4–1, 1-0), 7:30 p.m.
McCollum (0-5, 0-2) at Southwest Legacy (0-5, 0-2), 7:30 p.m.
Alamo Heights (4–1, 2-0) vs. Memorial (1–4, 0-2) at Edgewood Veterans Stadium, 7:30 p.m.
Kerrville Tivy (4–1, 2-0) at Uvalde (1–4, 1–1), 7:30 p.m.
Lockhart (3–2, 1–1) vs. Boerne Champion (2–3, 0-2) at Boerne ISD Stadium, 7:30 p.m.
Alice (3–2, 1–1) at Floresville (2–3, 0-2), 7:30 p.m.
Corpus Christi Calallen (4–1, 2-0) at Southside (4–1, 1–1), 7:30 p.m.
Corpus Christi Tuloso-Midway (2–3, 0-2) at Port Lavaca Calhoun (4–1, 2-0), 7:30 p.m.
Gregory-Portland (4–1, 1–1) at Somerset (4–1, 1–1), 7:30 p.m.
Houston St. Pius X (1–5, 0-0) at Central Catholic (3–3, 0-0), 7 p.m.
Houston St. Thomas (5–1, 0-0) at Tomball Concordia Lutheran (3–3, 0-0), 7 p.m.
Corpus Christi John Paul II (2–4, 0-0) vs. Holy Cross (3–3, 0-0) at Wheatley Heights Sports Complex, 7 p.m.
Texas School for the Deaf (2–3) at St. Gerard (2–3), 7:30 p.m.
MacArthur (1–4, 1–1) vs. Johnson (3–2, 1–1) at Comalander Stadium, 7 p.m.
Lanier (0-0, 0-0) vs. Brackenridge (0-0, 0-0) at Alamo Stadium, 7 p.m.
Southwest (0-0, 0-0) vs. McCollum (0-0, 0-0) at Harlandale Memorial Stadium, 7 p.m.
East Central (0-0, 0-0) at New Braunfels Canyon (0-0, 0-0), 7:30 p.m.
Judson (0-0, 0-0) at Smithson Valley (0-0, 0-0), 7:30 p.m.
San Marcos (0-0, 0-0) vs. Clemens (0-0, 0-0) at Lehnhoff Stadium, 7:30 p.m.
Steele (0-0, 0-0) at New Braunfels (0-0, 0-0), 7:30 p.m.
Churchill (0-0, 0-0) vs. MacArthur (0-0, 0-0) at Heroes Stadium, 7:30 p.m.
Johnson (0-0, 0-0) at South San (0-0, 0-0), 7:30 p.m.
Reagan (0-0, 0-0) vs. Roosevelt (0-0, 0-0) at Comalander Stadium, 7:30 p.m.
Jefferson (0-0, 0-0) vs. Wagner (0-0, 0-0) at Rutledge Stadium, 7:30 p.m.
Sam Houston (0-0, 0-0) vs. Highlands (0-0, 0-0) at Alamo Stadium, 7:30 p.m.
Veterans Memorial (0-0, 0-0) vs. Burbank (0-0, 0-0) at SAISD Sports Complex, 7:30 p.m.
Southwest Legacy (0-0, 0-0) vs. Harlandale (0-0, 0-0) at Harlandale Memorial Stadium, 7:30 p.m.
Alamo Heights (0-0, 0-0) at Lockhart (0-0, 0-0), 7:30 p.m.
Kennedy (0-0, 0-0) vs. Boerne Champion (0-0, 0-0) at Boerne ISD Stadium, 7:30 p.m.
Memorial (0-0, 0-0) at Kerrville Tivy (0-0, 0-0), 7:30 p.m.
Uvalde (0-0, 0-0) at Medina Valley (0-0, 0-0), 7:30 p.m.
Corpus Christi Calallen (0-0, 0-0) at Corpus Christi Tuloso-Midway (0-0, 0-0), 7:30 p.m.
Floresville (0-0, 0-0) at Port Lavaca Calhoun (0-0, 0-0), 7:30 p.m.
Somerset (0-0, 0-0) at Alice (0-0, 0-0), 7:30 p.m.
Southside (0-0, 0-0) at Gregory-Portland (0-0, 0-0), 7:30 p.m.
Antonian (0-0, 0-0) at Houston St. Thomas (0-0, 0-0), 7 p.m.
Tomball Concordia Lutheran (0-0, 0-0) at Houston St. Pius X (0-0, 0-0), 7 p.m.
Brownsville St. Joseph (0-0, 0-0) at Corpus Christi John Paul II (0-0, 0-0), 7 p.m.
Holy Cross (0-0, 0-0) at San Antonio Christian (0-0, 0-0), 7 p.m.
Hallettsville Sacred Heart (0-0, 0-0) at St. Gerard (0-0, 0-0), 7:30 p.m.
Shiner St. Paul (0-0, 0-0) at Temple Central Texas Christian (0-0, 0-0), 7:30 p.m.
Brooks Academy (0-0) at TMI (0-0), 7:30 p.m.
Madison (0-0, 0-0) vs. LEE (0-0, 0-0) at Comalander Stadium, 7 p.m.
Eagle Pass Winn (0-0, 0-0) vs. Harlan (0-0, 0-0) at Farris Stadium, 7 p.m.
Roosevelt (0-0, 0-0) vs. Johnson (0-0, 0-0) at Heroes Stadium, 7 p.m.
Burbank (0-0, 0-0) vs. Wagner (0-0, 0-0) at Rutledge Stadium, 7 p.m.
Highlands (0-0, 0-0) vs. Lanier (0-0, 0-0) at Alamo Stadium, 7 p.m.
Medina Valley (0-0, 0-0) vs. Memorial (0-0, 0-0) at Edgewood Veterans Stadium, 7 p.m.
Clemens (0-0, 0-0) at East Central (0-0, 0-0), 7:30 p.m.
New Braunfels (0-0, 0-0) at San Marcos (0-0, 0-0), 7:30 p.m.
New Braunfels Canyon (0-0, 0-0) vs. Judson (0-0, 0-0) at Rutledge Stadium, 7:30 p.m.
Smithson Valley (0-0, 0-0) vs. Steele (0-0, 0-0) at Lehnhoff Stadium, 7:30 p.m.
LEE (0-0, 0-0) vs. Reagan (0-0, 0-0) at Comalander Stadium, 7:30 p.m.
MacArthur (0-0, 0-0) vs. Madison (0-0, 0-0) at Heroes Stadium, 7:30 p.m.
Brackenridge (0-0, 0-0) vs. Edison (0-0, 0-0) at SAISD Sports Complex, 7:30 p.m.
Jefferson (0-0, 0-0) vs. Sam Houston (0-0, 0-0) at Alamo Stadium, 7:30 p.m.
Harlan (0-0, 0-0) at Southwest Legacy (0-0, 0-0), 7:30 p.m.
Harlandale (0-0, 0-0) at Southwest (0-0, 0-0), 7:30 p.m.
McCollum (0-0, 0-0) vs. Laredo Martin (0-0, 0-0) at Shirley Field, Laredo, 7:30 p.m.
Boerne Champion (0-0, 0-0) at Uvalde (0-0, 0-0), 7:30 p.m.
Kerrville Tivy (0-0, 0-0) at Alamo Heights (0-0, 0-0), 7:30 p.m.
Lockhart (0-0, 0-0) vs. Kennedy (0-0, 0-0) at Edgewood Veterans Stadium, 7:30 p.m.
Alice (0-0, 0-0) at Southside (0-0, 0-0), 7:30 p.m.
Corpus Christi Tuloso-Midway (0-0, 0-0) at Floresville (0-0, 0-0), 7:30 p.m.
Gregory-Portland (0-0, 0-0) at Corpus Christi Calallen (0-0, 0-0), 7:30 p.m. Port Lavaca Calhoun (0-0, 0-0) at Somerset (0-0, 0-0), 7:30 p.m.
Houston St. Thomas (0-0, 0-0) at Central Catholic (0-0, 0-0), 7 p.m.
Tomball Concordia Lutheran (0-0, 0-0) at Antonian (0-0, 0-0), 7 p.m.
San Antonio Christian (0-0, 0-0) at Brownsville St. Joseph (0-0, 0-0), 7 p.m.
South San (0-0, 0-0) vs. Churchill (0-0, 0-0) at Comalander Stadium, 7 p.m.
Lanier (0-0, 0-0) vs. Jefferson (0-0, 0-0) at Alamo Stadium, 7 p.m.
Southwest (0-0, 0-0) vs. Harlan (0-0, 0-0) at Gustafson Stadium, 7 p.m.
Memorial (0-0, 0-0) vs. Boerne Champion (0-0, 0-0) at Boerne ISD Stadium, 7 p.m.
Judson (0-0, 0-0) at East Central (0-0, 0-0), 7:30 p.m.
New Braunfels (0-0, 0-0) vs. Clemens (0-0, 0-0) at Lehnhoff Stadium, 7:30 p.m.
San Marcos (0-0, 0-0) at Smithson Valley (0-0, 0-0), 7:30 p.m.
Steele (0-0, 0-0) at New Braunfels Canyon (0-0, 0-0), 7:30 p.m.
LEE (0-0, 0-0) vs. Roosevelt (0-0, 0-0) at Heroes Stadium, 7:30 p.m.
Madison (0-0, 0-0) at South San (0-0, 0-0), 7:30 p.m.
Reagan (0-0, 0-0) vs. MacArthur (0-0, 0-0) at Comalander Stadium, 7:30 p.m.
Edison (0-0, 0-0) vs. Highlands (0-0, 0-0) at Alamo Stadium, 7:30 p.m.
Sam Houston (0-0, 0-0) vs. Burbank (0-0, 0-0) at SAISD Sports Complex, 7:30 p.m.
Wagner (0-0, 0-0) vs. Veterans Memorial (0-0, 0-0) at Rutledge Stadium, 7:30 p.m.
Laredo Martin (0-0, 0-0) vs. Harlandale (0-0, 0-0) at Harlandale Memorial Stadium, 7:30 p.m.
Southwest Legacy (0-0, 0-0) vs. Eagle Pass Winn (0-0, 0-0) at Cozel-Foster Memorial Stadium, Eagle Pass, 7:30 p.m.
Alamo Heights (0-0, 0-0) at Medina Valley (0-0, 0-0), 7:30 p.m.
Kerrville Tivy (0-0, 0-0) at Lockhart (0-0, 0-0), 7:30 p.m.
Uvalde (0-0, 0-0) vs. Kennedy (0-0, 0-0) at Edgewood Veterans Stadium, 7:30 p.m.
Corpus Christi Calallen (0-0, 0-0) at Alice (0-0, 0-0), 7:30 p.m.
Gregory-Portland (0-0, 0-0) at Corpus Christi Tuloso-Midway (0-0, 0-0), 7:30 p.m.
Somerset (0-0, 0-0) at Floresville (0-0, 0-0), 7:30 p.m.
Southside (0-0, 0-0) at Port Lavaca Calhoun (0-0, 0-0), 7:30 p.m.
Antonian (0-0, 0-0) at Houston St. Pius X (0-0, 0-0), 7 p.m.
Central Catholic (0-0, 0-0) at Tomball Concordia Lutheran (0-0, 0-0), 7 p.m.
Corpus Christi John Paul II (0-0, 0-0) at San Antonio Christian (0-0, 0-0), 7 p.m.
St. Gerard (0-0, 0-0) at Temple Central Texas Christian (0-0, 0-0), 7:30 p.m.
Hallettsville Sacred Heart (0-0, 0-0) vs. Shiner St. Paul (0-0, 0-0) at Comanche Stadium, Shiner, 7:30 p.m.
Austin St. Dominic Savio (0-0, 0-0) vs. Holy Cross (0-0) at Wheatley Heights Sports Complex, 7 p.m.
Churchill (0-0, 0-0) vs. Johnson (0-0, 0-0) at Heroes Stadium, 7 p.m.
MacArthur (0-0, 0-0) vs. LEE (0-0, 0-0) at Comalander Stadium, 7 p.m.
South San (0-0, 0-0) vs. Reagan (0-0, 0-0) at Heroes Stadium, 7 p.m.
Highlands (0-0, 0-0) vs. Brackenridge (0-0, 0-0) at Alamo Stadium, 7 p.m.
Harlan (0-0, 0-0) vs. Laredo Martin (0-0, 0-0) at Shirley Field, Laredo, 7 p.m.
Shiner St. Paul (0-0, 0-0) at St. Gerard (0-0, 0-0), 7:30 p.m.
Clemens (0-0, 0-0) vs. Judson (0-0, 0-0) at Rutledge Stadium, 7:30 p.m.
East Central (0-0, 0-0) vs. Steele (0-0, 0-0) at Lehnhoff Stadium, 7:30 p.m.
New Braunfels Canyon (0-0, 0-0) at San Marcos (0-0, 0-0), 7:30 p.m.
Smithson Valley (0-0, 0-0) at New Braunfels (0-0, 0-0), 7:30 p.m.
Johnson (0-0, 0-0) vs. Madison (0-0, 0-0) at Comalander Stadium, 7:30 p.m.
Roosevelt (0-0, 0-0) vs. Churchill (0-0, 0-0) at Heroes Stadium, 7:30 p.m.
Burbank (0-0, 0-0) vs. Lanier (0-0, 0-0) at Alamo Stadium, 7:30 p.m.
Veterans Memorial (0-0, 0-0) vs. Sam Houston (0-0, 0-0) at SAISD Sports Complex, 7:30 p.m.
Eagle Pass Winn (0-0, 0-0) at Southwest (0-0, 0-0), 7:30 p.m.
Boerne Champion (0-0, 0-0) at Alamo Heights (0-0, 0-0), 7:30 p.m.
Lockhart (0-0, 0-0) at Uvalde (0-0, 0-0), 7:30 p.m.
Medina Valley (0-0, 0-0) at Kerrville Tivy (0-0, 0-0), 7:30 p.m.
Alice (0-0, 0-0) at Gregory-Portland (0-0, 0-0), 7:30 p.m.
Corpus Christi Tuloso-Midway (0-0, 0-0) at Somerset (0-0, 0-0), 7:30 p.m.
Floresville (0-0, 0-0) at Southside (0-0, 0-0), 7:30 p.m. Port Lavaca Calhoun (0-0, 0-0) at Corpus Christi Calallen (0-0, 0-0), 7:30 p.m.
Central Catholic (0-0, 0-0) at Antonian (0-0, 0-0), 7:30 p.m.
Houston St. Thomas (0-0, 0-0) vs. Houston St. Pius X (0-0, 0-0) at NRG Stadium, 8 p.m.
Holy Cross (0-0, 0-0) at Brownsville St. Joseph (0-0, 0-0), 7 p.m.
Temple Central Texas Christian (0-0, 0-0) vs. Hallettsville Sacred Heart (0-0, 0-0) at Brahma Stadium, Hallettsville, 7:30 p.m.
Texas Wind (0-0) vs. Brooks Academy (0-0) at Brooks Collegiate Academy, 7 p.m.